Lead Teacher Caitlin Rafferty discusses a ThinkCERCA lesson with one of her students. 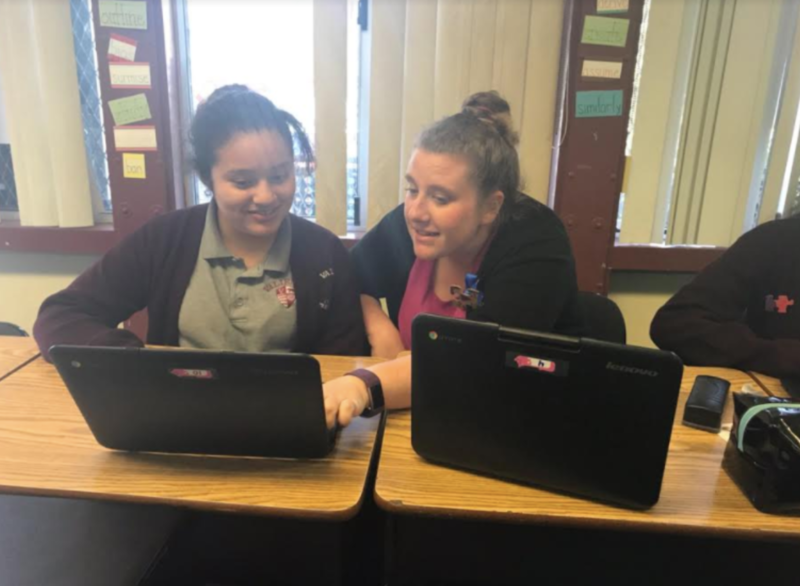 In the 2017-18 school year, Valiente College Prep in South Gate, California, completed more ThinkCERCA lessons than almost any other partner school. 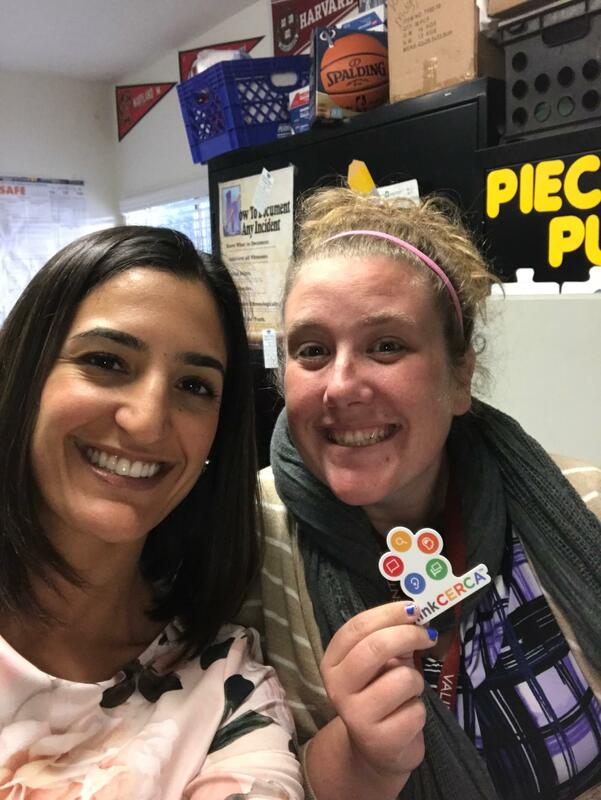 We interviewed Caitlin Rafferty, the Lead ThinkCERCA Teacher at Valiente, to discuss how she helped lead a robust and successful implementation of ThinkCERCA at her school. ThinkCERCA: Caitlin, congratulations on your success! Can you give us some insights into what contributed to a your successful ThinkCERCA implementation? Each teacher implements ThinkCERCA into their curriculum at least once a month. A schedule is created for the teachers – in this schedule teachers are assigned which weeks they are using ThinkCERCA as well as what lesson type they are using that day. Teachers have the ability to pick which article they want to read with their class. We have both teacher and student support for ThinkCERCA. Students and staff know the expectations for the use of this program. ThinkCERCA: You and your principal, Dr. Perez, work quite closely. Can you describe how you’ve worked together to roll out implementation of ThinkCERCA? 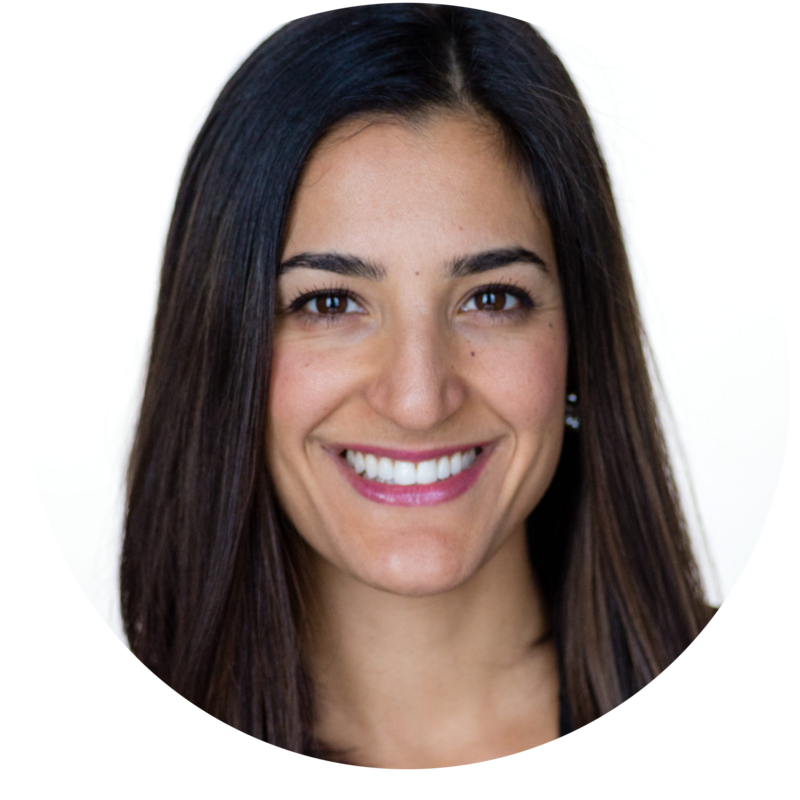 Caitlin: Dr. Perez and I work closely and meet many times throughout the week. We have rolled out the implementation of ThinkCERCA by assigning certain weeks to a teacher’s Google calendar. Valiente staff live off their Google calendar! I create the event; then teachers are invited to their week so it is on their calendar. ThinkCERCA: What do you think the administrator’s ideal role is in a successful implementation? Caitlin: The administrator’s ideal role for successful implementation would be to support the teachers. Dr. Perez does this each and every day! She holds teachers accountable which is what we ask of our students as well. Valiente also has high expectations for both students and staff. ThinkCERCA: How about the ideal role for the lead teacher? Caitlin: The ideal role for the lead teacher would be to model implementation of ThinkCERCA and be the liaison between the school and ThinkCERCA. At Valiente, as the lead teacher, I am the contact person if there are any ThinkCERCA questions as well as reviewing data with teachers before presenting it to the board or other stakeholders. Caitlin credits the schoolwide collaboration to success with ThinkCERCA. ThinkCERCA: Your success is not based on one or two teachers implementing, but rather a collective effort from all teachers. How did you create that culture of unity of vision and execution of ThinkCERCA? Caitlin: We created a culture where all teachers have agreed to complete ThinkCERCA; this is also an expectation set down by Dr. Perez. In the first trimester, the top teacher each week/month received a handmade award and an announcement in front of their class. The top teacher at the end of each trimester received a small trophy stating they were the top ThinkCERCA user for the trimester. Dr. Perez also sends out weekly emails with top teachers of the week as well as top teachers of the year. Our staff have taken those emails to another level! Many teachers will brag about their standing in the weekly emails as a friendly competition. 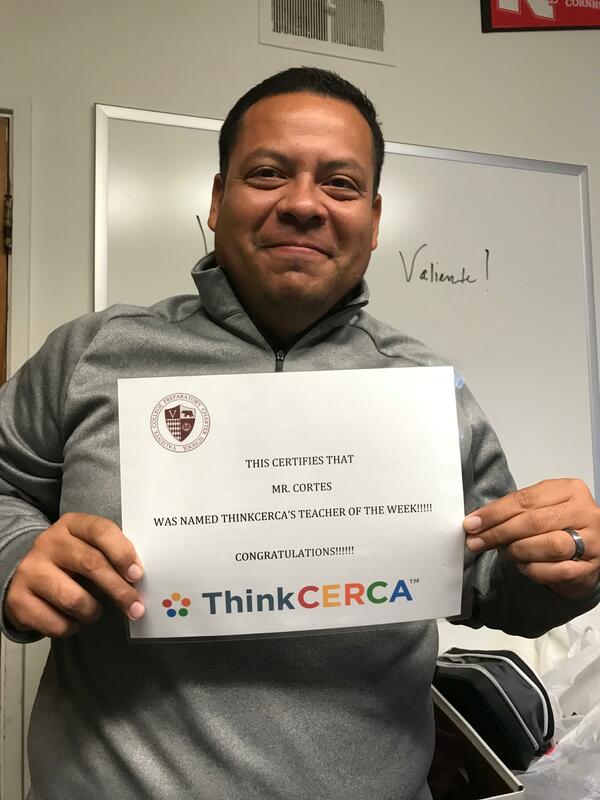 Teacher Luis Cortes becomes the ThinkCERCA teacher of the week. ThinkCERCA: How often do you meet as a staff (or department or teams) to discuss ThinkCERCA? What do you discuss during those meetings? Teachers who have given the ThinkCERCA benchmark tests present their data findings to the rest of the staff. Each teacher has chosen two students to be their focus students for the year. Teachers monitor these students benchmark data points as well as their grades from ThinkCERCA assignments. 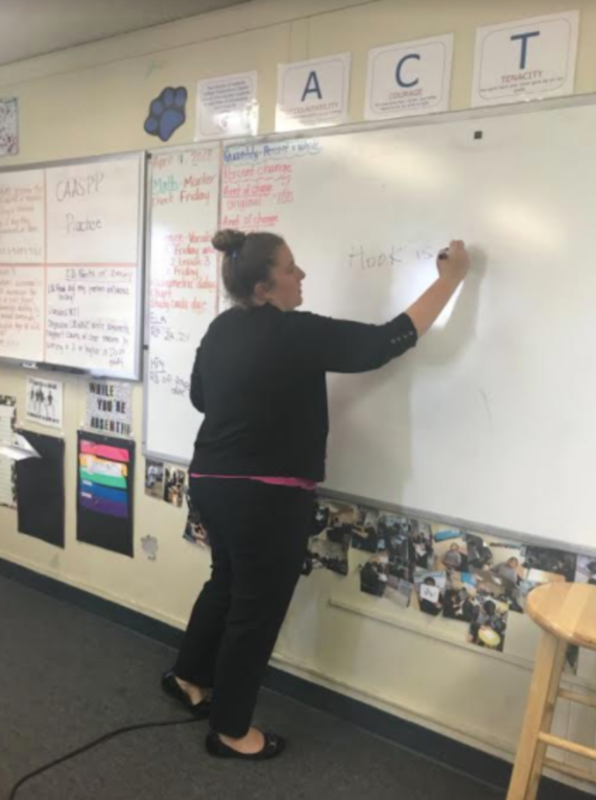 ThinkCERCA: How has ThinkCERCA contributed to student growth at Valiente College Prep? Caitlin: We use ThinkCERCA mostly for our writing data. Valiente gave benchmark one in August right at the beginning of the school year. Then we gave benchmark two in December right before students left for winter break. Between benchmark one and benchmark two we had 51 students in grades 4-7 improve in their writing. That is about 40% of our student body! With the help of ThinkCERCA our students are able to write longer – each grade level has to write three paragraphs minimum in their CERCA response. Our higher grades need to write a five-paragraph response. This helps the students know the format of an essay as well as supports the Common Core Standards for ELA. This stamina will help the students when it comes to state testing. ThinkCERCA: What are your favorite components of ThinkCERCA? Caitlin: My favorite components of ThinkCERCA are the reading comprehension questions because it helps me see if my students are really reading the article and understanding what they are reading. I use this as a test grade so that my students take the comprehension questions seriously but also so their parents can see their reading skills. ThinkCERCA: If teachers from other schools were to come observe ThinkCERCA in one of the classrooms at Valiente, what would they see? Caitlin: This was a question I actually posed to the Valiente staff because each teacher uses ThinkCERCA in a different way. Teachers tie their ThinkCERCA article into the content; Our science teachers use ThinkCERCA to improve the students’ scientific reading levels. Our 5th- and 6th-grade teacher uses ThinkCERCA as classwork and homework. Students are asked to complete Direct Instruction lessons before performing a writing task to remind them how to write a claim, cite text evidence and write a conclusion statement. The Additional Reading Practice helps with student engagement. It helps to enhance the classroom discussion that will take place during the week. ThinkCERCA: Your students have had lots of ThinkCERCA lessons. What is their reaction to the program? Caitlin: Since this question is asking about student’s perspective of ThinkCERCA I thought it was only appropriate to ask the students at Valiente their thoughts on ThinkCERCA. Students shared that they do attribute ThinkCERCA to their growth because it gives them reading and writing practice. The students get to read articles that have to do with the content they are learning in class; then they are given a writing task to help them focus on certain elements of their writing – such as citing evidence. Students like the articles of ThinkCERCA and found them interesting. They LOVE that ThinkCERCA can read to them and use the audio component on as many lesson as they can. This is also very helpful as a teacher; some students need to have an article read to them in order for them to understand it better. It’s nice to have a different voice read the article to them and grasp their attention. ThinkCERCA: How do you prevent burnout for students? I think at Valiente, we prevent ThinkCERCA burnout with the use of our schedule. Within the schedule teachers wrote which days they are doing ThinkCERCA so no two teachers are working on ThinkCERCA on the same day. This also gives the teachers authentic data of the students' reading and writing skills. School Success Manager Mona Kiani visiting Valiente. ThinkCERCA: Any advice to other lead teachers or administrators looking to execute their vision like you and Dr. Perez have? Caitlin: Some advice that I would like to share is having open, honest communications between staff members as well as students in regards to ThinkCERCA. I would say make sure all teachers and staff are on board with working on ThinkCERCA. I would also suggest having a point person who works with ThinkCERCA, understands it, and can help implement it. To engage the students, make ThinkCERCA fun for all – add competitions within the classroom and among staff, set goals with the students, and change the types of lessons up so it’s not the same for the students as well as the teacher. None of this success would have been possible without all the support from the staff, students, and families at Valiente College Prep. It also would not be possible without Mona, who answers all emails that any teacher sends. She has helped us in so many ways.